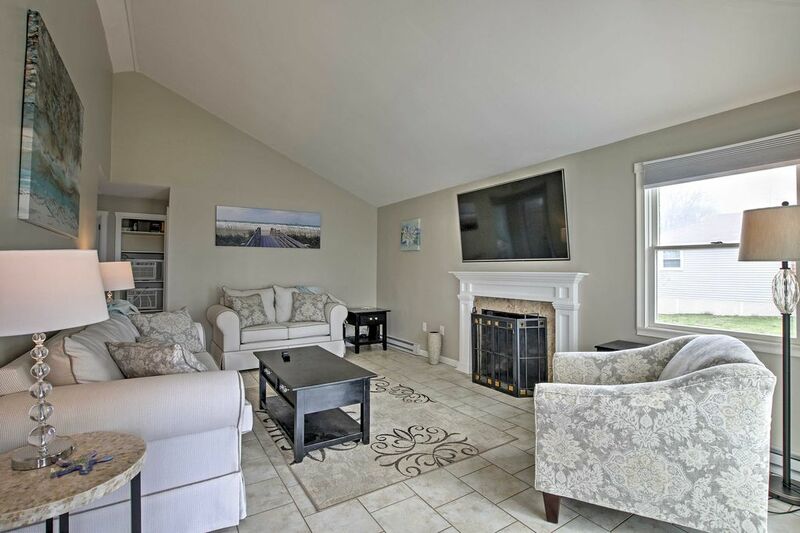 Make the most of your Old Lyme beach vacation when you stay at this newly remodeled 3-bedroom, 1-bathroom vacation rental cottage, just steps from the shores of the Atlantic Ocean. With sleeping accommodations for up to 6 traveling guests, this cottage is perfect for groups of families or friends seeking a comfortable rental with easy access to the beach. Nestled between the shores of Old Lyme Beach and a large unoccupied field, this cottage boasts privacy and comfort. As you walk through the cottage’s brand new renovations, elegant furnishings, and beach themed decor, you're sure to feel right at home. Enter the home through the luxurious well-equipped kitchen, complete with granite countertops, new appliances, and decorative, mosaic tile siding. Whip up some of your favorite home recipes while conversing with your guests who can keep you company at the kitchen bar area. Savor your home cooked meals gathered around the 4-person dining room table or bring the feast outside to the patio table with views of the beach. Walk up and down the beach to catch the last few rays of sunshine. Upon returning to the house, use the outdoor shower to rinse away any residual unwanted beach sand that you might bring into the house. When you're ready to unwind, relax on the cozy new living room sofa or arm chairs while watching one of your favorite shows on the flat-screen cable TV. You can also plug in the Playstation 3 for a night of family-fun gaming. Freshen up in the tidy full bathroom before slipping into the soft sheets of one of the mattresses in the cottage. Whether you're sleeping in the master bedroom king-sized mattress or the one of the twin-sized beds in the house, you’re sure to enjoy peaceful, uninterrupted nights of sleep. Sleep in knowing that you will still have plenty of time to do everything you want to do, just minutes from the property. The beach is right across the street, you can splash around in the ocean, sunbathe and build sandcastles at any given moment during your stay! To further explore the waters of the Atlantic, Black Hall River or one of the many other coves, rent a stand-up paddleboard, kayak or canoe from Black Hall Outfitters. Spend a day fishing with one of their group outings or simply paddle around and discover the beauty of Old Lyme on your own! When you aren't surfing or adventuring across the Long Island Sound, explore the inland wonders of Old Lyme. Visit the many fine art galleries that dot the area, at least 10 are within a 15 minutes drive of the property! Take your recent art inspirations to the Tanger Outlet Mall in Westbrook and fashion yourself a new look at one of the many brand name stores that make up this large shopping center. On your way back to the property, stop by some of the many antique stores along Boston Post Road to find the perfect gift for a loved one or a piece of memorabilia. After a full day of fun, you're sure to have built up a decent appetite. Choose from a large variety of fine and casual dining options and treat yourself to a multi-course meal or entertaining dinner experience to satisfy your palate and stomach. - Amenities include a well-equipped kitchen, beach access, 2 flat-screen cable TVs, PlayStation 3, central heating, portable air-conditioning, wireless internet access, and more! - Unbeatable Location - Walk just a few steps to the private beach and boardwalk. Within minutes from art galleries, restaurants, water sports outfitters, casinos, shopping centers, and more! What a wonderful get-a-way in a lovely, private, beach community! This house is very clean and well-kept inside and out. The view of the beach, which is maybe 50 yards away from the house, is sooo nice! The beach itself is clean, except for the thousands of shells you will find (bring beach shoes- we bought 98 cent flipflops at Job Lot which did the job, and washed and left them there for others to use. Inside the house itself, the decor is very attractive.The kitchen has everything you need, right down to Alexa for some music! The sun room is the perfect place to begin the day with a cup of coffee or tea, or if you choose, you can sit outside at the patio table. We were there from Thursday to Sunday in the off-season, so we had the beautiful beach all to ourselves on the weekdays...well except for the seagulls! After a day at the beach, we didn't feel like cooking(although the kitchen has beautiful counters and is well-stocked), so we actually found several places that delivered! In the evening, you can watch the large wall-mounted TV, or play some of the games you'll find in the closet. Some people had a bonfire at the beach, but I don't know if that's allowed. The owner provides beach chairs, which takes the worry out of packing yours into the car! There are several things in the house that just made life easier, and we appreciated that! Each room has an a/c...loud, but they work well. We wish we could've opened the windows at night, but not a deal breaker! Beds are very comfortable, with very nice bedding. All-in-all, we enjoyed our stay, and would definitely recommend this house to anyone. Everything was exactly as pictured and was clean and well-maintained. The proximity to the beach was great and allowed for easy, relaxing strolls and putting your toes in the sand at the first sign of sun. Although the weather didn't cooperate during our stay, shopping was a short drive away. Nearby restaurants, ice cream stops and coffee shops were great! This cottage was very nicely decorated, clean and well equipped, from kitchen tools and utensils, to beach chairs and beach umbrella. We felt very comfortable there and grilled out every night. Very close to clean beach. The outdoors heated water shower was a plus. We were very happy with our stay and would recommend it to anyone. Thank you for creating a wonderful vacation experience for us. It was the best experience. The beach house is beautiful. Contemporary decorated with a nice layout that made it comfortable for everyone. White sands beach is walking distance and outdoor shower was a great addition after a hot day on the beach. We were impressed by owner's attention to everything during our stay, including check in and all the questions we had. We highly recommend this house. We had 5 adults and a toddler. Best experience. Thank you Ron ! This house felt like home! We loved our stay in this clean well maintained home. The owners are so nice! They are easy to contact and they respond immediately! They are super thoughtful with all the amenities in the home. The house was calming and the decor was tasteful. You have a direct view of the private beach from the deck, which is nice when you are outside relaxing or eating dinner. This house is only 3 or 4 houses away from the public beach. (very small walk) This was nice for our kids. Not far to walk back and forth! The outside shower was a nice bonus! We will definitely be back! This place was wonderful! Can’t say enough good things! The only thing that we could think of that would make this house even more desirable would be a washer and dryer.